In the years following the release of Narrow-Caster, their “comeback” album after a 12-year hiatus, New Jersey band 3RDegree have been hard at work on its follow-up, which was finally completed in the early summer of 2012. The band’s lineup has also undergone some changes: drummer Rob Durham (who guests on one track) was replaced by Aaron Nobel (who joined the band just in time for their appearance at ProgDay 2009), while second guitarist Eric Pseja had collaborated with them as a guest musician for the 2007 reunion concerts. As I pointed out in my review of Narrow-Caster, 3RDegree are one of those bands that are bound to divide opinions within the prog community. While critics have generally greeted their albums with words of praise, the public’s response has not always been equally enthusiastic. Though the band members proudly state their allegiance to the progressive rock camp, their sound – in true art-rock tradition – contains enough “mainstream” elements to make purists frown, eliciting doubts as to its actual prog quotient. George Dobbs’ extraordinary vocals (clearly more influenced by Stevie Wonder than Jon Anderson or Peter Gabriel) are also a sore point with those fans who find it hard to break away from the Seventies mould. The band’s frequent reliance on the conventional song form is another source of controversy for those who forget that, in fact, even in its heyday prog never completely rejected traditional song modes, though often rendering them almost unrecognizable. Compared to Narrow-Caster, The Long Division ups the ante in terms of complexity, while retaining its accessible, deceptively upbeat flavour. For starters, the songs’ running times have gradually increased from the average 4 minutes of Narrow-Caster to over 6 minutes for half of the tracks on The Long Division. While there are no epics in the conventional prog sense, the album is intended as a sort of loose concept that, while firmly rooted in the peculiar atmosphere of a US presidential election year, can also resonate with citizens of most Western countries, especially in the current global situation. The clean, geometric lines of the striking cover artwork contrast sharply with the stereotypically fanciful prog aesthetics, its bright blue and red hues identifying the two main US political parties, separated by an apparently unbridgeable gap. From a musical point of view, the main ingredients that made Narrow-Caster such as successful example of modern “crossover” prog – such as its memorable melodies – do not disguise the intricacy of the instrumental fabric and the frequent changes in tempo and mood. George Dobbs’ voice, authoritative as usual, is assisted by gorgeous, layered vocal harmonies reminiscent of early Yes or even The Beatles that complement the lush instrumental interplay. The double-guitar configuration, with Eric Pseja flanking founding member Patrick Kliesch, has undeniably beefed up the sound, though as a whole The Long Division comes across as a smoother-sounding effort, less reliant on high-powered riffs and more focused on Dobbs’ keyboards. The 10 songs on The Long Division are arranged in a pattern that alternates uptempo numbers with more laid-back ones. “You’re Fooling Yourselves” – a fitting introduction to the musical and lyrical themes of the album, mixed by Echolyn’s Brett Kull – showcases the band’s trademark blend of catchy hooks and subtle complexity, with intriguing vocal textures and sleek guitar solos ranging from meditative to energetic. The mellotron-infused “Exit Strategy”, with its airy, orchestral feel, is dominated by vocals, though Robert James Pashman’s strong bass lines emerge prominently. The bass is also the undisputed protagonist of the funky, exhilarating “The Socio-Economic Petri Dish” – sounding like Yes probably would if they had been founded in the 21st century, and displaying the band’s collective talent in both the instrumental and vocal department. “Incoherent Ramblings” (the longest track on the album at almost 8 minutes) is an extremely well-constructed piece, bringing together the mellow, atmospheric component of 3RDegree’s inspiration and the sense of urgency often lurking even in the more relaxed numbers; while the brisk “The Ones to Follow” offers another vocal showcase for Dobbs and an almost infectious chorus. The second half of the album opens with the hauntingly romantic, piano-led “A Work of Art”, the only song dating back from the early incarnation of the band, enhanced by sax, flute and mellotron and featuring an unusually subdued vocal performance by Dobbs. Things pick up with the slashing riffs and hard rock vibe of the Rush-influenced “Televised”, driven by Pashman’s fat, groovy bass line and Nobel’s muscular yet intricate drumming, the heaviness softened by the Beatlesian flavour of the harmony vocals. The short, gentle instrumental “The Millions of Last Moments” prepares the listener to the album’s grand finale – the melodic-with-a-bite, sinuous “Memetic Pandemic”, which allows Dobbs to shine on piano and organ as well as in the singing department, and the catchy “A Nihilist’s Love Song”, based on a chiming acoustic guitar line reinforced by piano and layers of vocal harmonies. 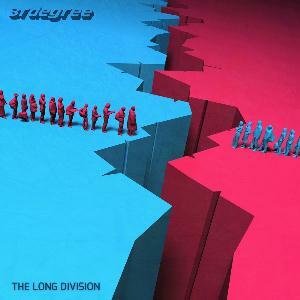 With The Long Division, 3RDegree prove that they have reached their full maturity as a band, delivering an intelligent, well-rounded example of modern progressive rock. Much like Man On Fire’s splendid 2011 album Chrysalis, the album epitomizes the “new frontier” of the genre without denying the legacy of the past, or pandering to blatantly commercial trends. Avoiding the bloated excesses of many retro-oriented bands, The Long Division is a complete package of classy music, top-notch vocals and thought-provoking lyrics – recommended to anyone but incurable elitists. Very nice, as usual. Will check out. Thank you! I hope you will like it.